Incidentally, Wikipedia suggests that if you don’t flail about, you’re unlikely to sink completely in quicksand because it’s denser than the human body. Of course it can trap you long enough to dehydrate, get caught by the tide, eaten by wolves, etc. Though Hugo points out that in the sink holes of the sewers, density varies wildly. — Javert vs. the sewer grate. Cataloguing Marius’ injuries: Except for a broken collarbone, they’re mostly shallow – there’s just a lot of them. His lengthy convalescence and fever are probably due to infection. Hazards of the sewer as an escape route. This entry was posted in Book Commentary and tagged Paris, Sewers on June 15, 2018 by Kelson Vibber. One of the interesting things about re-reading Les Misérables after so long is not just what I’d forgotten, but what I’d remembered incorrectly. For example, I remembered that after Jean Valjean carried Marius out of the barricaded zone through the sewer grate, the action stopped, Victor Hugo spent 10-15 pages describing the history and layout of the Paris sewers in detail, and then when you returned to Valjean’s flight through those underground tunnels, you knew exactly where he was at any given point. I also remember a distinct impression that, like everything else, Paris has the best sewers. Hugo does stop the action dead. And he does spend a lot of time discussing the history of the sewers. But he starts by complaining at length how much of a waste it is that we flush all our, well, waste into the ocean instead of trucking it out to the countryside for fertilizer. He’s actually calculated the cost savings (or used someone else’s calculations) when compared to sending ships out to mine penguin guano and such. That’s right: Victor Hugo really knows his sh—well, anyway, he goes on to describe the geology of Paris and the history and nightmarish character of the sewers, up through an expedition to map them starting in 1805 that found poisoned air, cave-ins, quagmires, walled-up dungeon cells, and skeletons. He goes on to describe the improvements made by the survivors — yes, survivors — but only in the most general of terms. The man’s name was Bruneseau. I suppose Paris doesn’t do anything by halves in Hugo’s mind, because rather than having the best sewers, it seems that Paris has the worst sewers. At one point he blames the sewers for Paris’ poor air quality, citing a study that showed the air above a dung-heap is cleaner than the air in Paris (the equivalent of those modern studies that try to sell you no-touch antibacterial soap for your kitchen sink, I suspect), neglecting to consider other sources of pollution like, say, thousands of cooking, heating and industrial fires crammed into a small area. When he returns to Valjean and the unconscious Marius, he starts drip-feeding information about the layout as Valjean reaches each new area: sections that are more navigable or more labyrinthine, the ring sewer, how lucky Valjean was that he went one way and not the other, or that the police patrol decided not to split up, the problem of floor collapses leading to, at one point, a bottomless pit of sludge leaking into the silt below (as incorporated into the movie). Valjean spends hours trying to get out. He climbs down around midday, and emerges in the evening. By the end he’s utterly exhausted. An interesting fact: Javert isn’t there looking for Valjean. After reporting in, he went back to his normal duties, and followed Thénardier along the river to a locked sewer grate (Thénardier had a key), and was waiting around outside to catch him as he left. Thénardier spotted Valjean with a body, didn’t even recognize him, and figured he’d let him out the same grate to distract the police. Javert’s face twitched, as always happened when someone thought him capable of making a concession. Also interesting: Valjean doesn’t ask Javert to let him take Marius home, but to help him do it. It actually makes more sense this way, because he’s allowing himself to stay within sight of Javert rather than expecting the policeman to trust that he’ll show up when he says he will. After dropping him off at M. Gillenormand’s home, he asks to be allowed to stop at home for a few minutes. Javert agrees, waits by the door until he climbs the stairs…and leaves. The cab driver complains about bloodstains, but not anything else, so presumably Valjean manages to clean himself and Marius up a little bit after climbing out of the pit. Marius’ grandfather is convinced that he’s dead, and wails on and on about how the ungrateful wretch did it just to spite his dear old grandfather. He knew him when he was just that high, and while he may have acted mean toward him, the boy knew he was joking (no, he didn’t)… All the while the doctor is cleaning him up and checking his wounds, and when Marius opens his eyes, M. Gillenormand faints. It reminds me of the scene in which Valjean is buried alive and the real Fauchelevent thinks he’s uncovered him too late. Pages covered: 1061-1103. 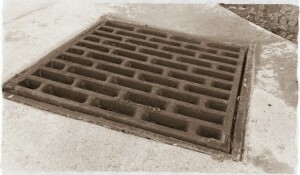 Photo of a storm drain grating from one of my walks around the neighborhood. This entry was posted in Book Commentary and tagged Gillenormand, Javert, Jean Valjean, Marius, Paris, Sewers, Thenardiers on December 28, 2013 by Kelson Vibber.